Jude has a very active imagination. He loves to come up with new characters. 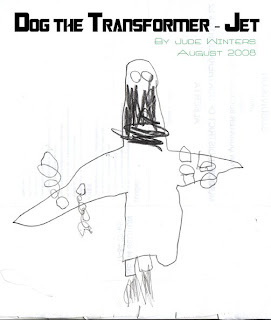 For instance, he came up with his own Transformer, which he called "Dog." He also came up with his own dragon, which he calls a "monkey dragon." Mom: What does your monkey dragon look like? Jude: Yeah, a snout. And a brown snout, and it has bear legs, it has six bear legs, and it has... I'm going to tell you about the little egg to go on here. Jude: The egg has a crocodile tail around it so it can protect the egg. Jude: And the egg has yellow stripes and it's back is a yellow back. Jude: No, the monkey-dragon's back is a lion back. Mom: Okay. And what can the monkey-dragon do? Jude: It can blow rocks and it can blow monkeys so it can get the bad guys; and the monkeys can shoot bombs with their eyes. 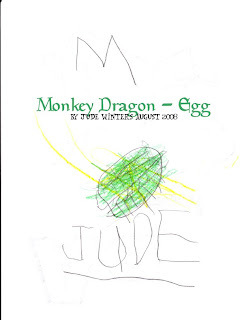 Jude: And the monkey-dragon has a force-field around it to protect it, it has a laser one. Mom: It has a laser one? Is your monkey-dragon part robot? Jude: Uh, no, but it's tail is. Mom: Okay, so is that where the laser force-field is? Jude: Yeah. It can put it's tail around it, even if it touches a pokie on itself it won't die. Mom: Okay. Can we talk about Dog for a while now? Jude: I made up Dog as a superhero. Mom: I thought he was a Transformer. Jude: Yeah, how many guys you wanna talk about now? Jude: Okay, we can talk about the superhero Dog another day. Mom: So are you saying that the superhero Dog is different from the Transformer Dog? Jude: Yep. They're different. 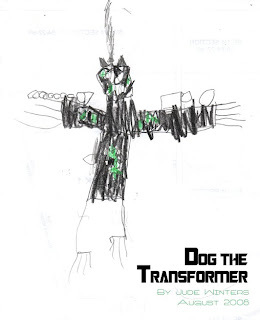 The superhero Dog is just a dog, not a Transformer. And it has a cape on it's back. Mom: Okay. What's his superpower? Jude: Dog can blow fire out his mouth. Mom: Okay. So how is he different from the Transformer one? Mom: Okay, so tell me about the Transformer Dog? What can he transform into? 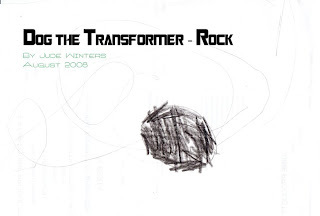 Jude: A rock, if the bad guys are going to attack him, if he sees a bad guy or anything. And he has three guns, he has a gun on his head and on his arms, and the kind of bullets he has on his head go superfast, and he has all guns on his arms and all around his head and on his two arms. On the first arm it blows BIG bullets, and on the second arm it blows little bullets, and on his head it blows really tiny bullets. So how they come out is they go in Dog's arm when he's gonna have a fight with a bad guy they come out like this. (Indicates with his hand on his arm.) He has four guns on each arm. One can go to the front, one can go this way (pointing out) one can go this way (pointing in) and backwards. Only on his head it only goes frontwards and backwards. He has two going backwards and two going frontwards. He has eyes in the back of his head. Mom: Kind of like your mom, hey? Jude: Nope! You don't have eyes in the back of your head! God made you with no eyes in the back of your head! Mom: Oh, but maybe they're invisible! Isn't it funny how I can see you when I'm not looking at you? Jude: (Apparently, no response to that.) And Dog can turn into a fighter plane. 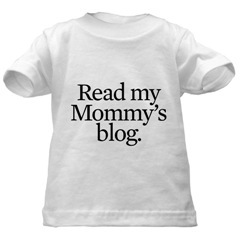 Jude: No, but a couple more things, when he's a fighter plane, he can go zooom! and he's the fastest Transformer you've ever seen. If a Transformer is gonna help a bad guy, and Dog sees 'em, he just flies up and throws them down to the ground! And that's pretty much all about Dog. Mom: Okay! Thanks for helping me! (Much later, after a bath.) And Mom, I didn't tell you about the monkey dragon's ears, so I'll just tell you right now. It's cheetah ears. Mom: (typing) Okay. Anything else? Jude: No, that's all I need to tell you. I'm just imagining Jude and Scooter getting together for a draw-a-thon - the stories they would tell! Today I was regaled with the tale of Scooter's latest dream - involving Princess Dora and a moose - sometimes the moose was dead, and sometimes he was making breakfast - not sure how that all works! How old are your boys? 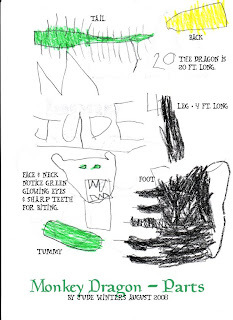 I'm thinking of Jude as a 4 yr. old. Oh, I'm sure they would have a lot of fun! Jude will actually be 6 in November. He is starting grade one this year. Noah is 4 1/2. Jabin will be 3 in November. 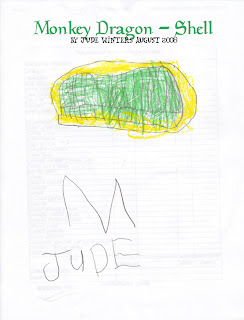 Jude also has fairly amazing dreams that he remembers on a regular basis--he just takes after his mom in so many ways. What a great imagination and he is so smart too. Great pictures!!! What a cutie. You gotta love it when they are so incredibly cute and innocent. My youngest just turned 5, 3 days ago and she is just adorable when she explains to you how things just are. So fun to listen to them at this age! I love the way kids view the world.